In December 2008, Robert Fowler, a Canadian diplomat, and his aide were abducted while on a United Nations mission in West Africa. Their case was not an isolated incident. CBC reporter Mellissa Fung was kidnapped while on assignment in Afghanistan in October, 2008. Like many other cases involving foreigners kidnapped by extremists groups, Mellissa Fung’s story was shielded by a news blackout, which meant that few elements of her disappearance were reported in the mainstream media. Faced with the news of Fowler’s abduction, editors around the world had a decision to make: reveal that he had been kidnapped, or embargo the story, as they did Mellissa Fung’s. They had a lot to consider. But most importantly, they had to weigh two competing ethical duties. The first, to minimize harm done to the people involved in the story. The second, to report the truth. 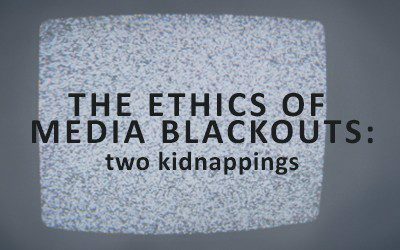 The following case study explores the complexities of media blackouts, the policies (or lack thereof) guiding this journalistic practice and an analysis of the treatment of Fowler’s story based on a comparison to the Mellissa Fung case.